Flower Works II - A unique, friendly and professional take on the floral industry. We are a true husband and wife team and handle every order personally. 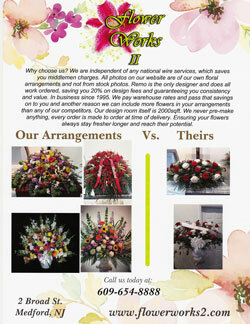 This is our way to guarantee an educated florist council for each and every customer. By giving you our undivided attention we make sure your flower purchasing experience is magical and consistant. 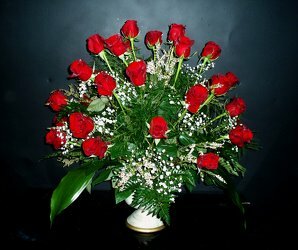 Our aim is for you to be sure you are our focus, and also create a sense of excitement by delivering a flower purchase experience that is unique in the floral industry. Let our experience be your guide to flowers with impact and value. 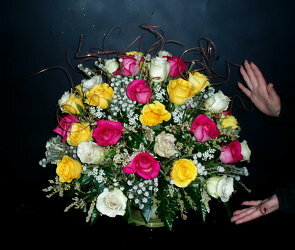 Call our floral design studio in Medford at 609-654-8888 to order or to make an appointment. Feel free to order flowers from our online store and have them delivered with as much care as we put into making every arrangement/event special. We are independent of any national wire services, which saves you middlemen charges. All photos on our website are of our own floral arrangements and not from stock photos. Remo is the only designer and does all work ordered, saving you 20% on design fees and guaranteeing you consistency and value. In business since 1995. 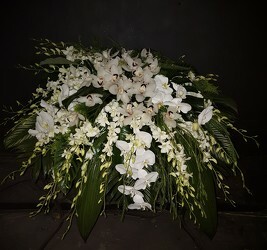 We pay warehouse rates and pass that savings on to you and another reason we can include more flowers in your arrangements than any of our competitors. Our design room itself is 2000sqft. We never pre-make anything, every order is made to order at time of delivery. Ensuring your flowers always stay fresher longer and reach their potential. Please feel free to review us on google by clicking the google badge below. Flower Works II delivers flowers to Medford NJ, as well as Medford Lakes, Marlton, Mt.Laurel, Shamong, Tabernacle, Southampton, Hainesport, Lumberton, Mt Holly, Moorestown, and Cherry Hill. If you have questions about a delivery location please call us before placing your online order to ensure a successful, pleasant experience. Flower Works II is open 7 days a week by appointment, 24/7 online.